In today’s digital age, it is crucial for the success of a business to have a strong online presence. Smart website development, backed by strategic Internet marketing, is imperative. A website that successfully translates into an innovative mobile app can take your brand to the next level and successfully differentiate your business from its competitors. Coming on the heels of a $3.5 million MacArthur Foundation grant to the City of Philadelphia to help shrink the prison population by 34 percent, the Reclamate app/program has already sparked interest from the local criminal justice community, said project developer Alan Holden. Smartphone-based Reclamate nudges nonviolent offenders to keep up on their post-release job training, drug testing, parole visits, and other pro-social behaviors. And it rewards good deeds with extra perks “like an extended curfew on weekends,” he said. While conventional tech solutions (think ankle bracelets) for monitoring parolees carry a $5-to-$27-per-day service charge, his smart alternative could be done for $3 to $7 per day, Holden said, with monitoring software from WhiteLake Interactive. 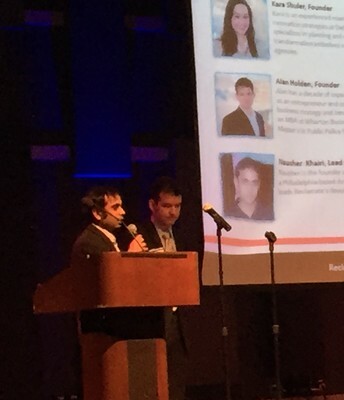 Creative Director/Owner Nausher Khairi giving a presentation at the 2016 University Of Pennsylvania Appitup Finals. Your website should be an extension of your brand’s image, and showcase a clear message, an engaging design and a compelling call to action. Whitelake Interactive can help your business establish its online identity and create a digital experience for your brand that effectively communicates the unique services that you provide to your customers. Using the latest technology in website development, our team of skilled designers creates visually appealing, easy to manage websites using HTML5. When you hire us to build a mobile application, you can expect a custom, aesthetically appealing and functional app tailored to your business and its needs. At Whitelake Interactive, we strive to develop mobile apps for iPhone, iPad and Android platforms that are anything but ordinary. Our team of programmers stays up to date on the latest trends in mobile technology to ensure that we offer our clients a superior product. Software development is our passion. We know that no two clients are the same. We work hard to understand your needs and offer you the best software solution to elevate your business. We have helped numerous small businesses convert their manual and spreadsheet-based operations into a secure cloud based web-portal with front-end interfaces that include mobile apps and online interface. You can have a fantastic website, but if no one ever sees it, it serves no purpose. No matter what stage your company is in, Internet marketing is crucial. More online visibility means more business. At Whitelake Interactive, we offer results-driven digital marketing services including search engine optimization (SEO) and search engine marketing (pay per click ads for Google, Yahoo and Bing.) We make it our mission to stay ahead of the trends and the ever-changing landscape of the digital marketing world. Please contact us to learn more, inquire about career opportunities, request a proposal, or just to talk. 2015 © WhiteLake Interactive LLC | Terms of Service.